Powered by the Intel ® dual-core processor and 4GB of memory, the VS-4108 Pro+ delivers high performance to ensure stable recordings and smooth playbacks of multiple megapixel cameras. It is designed for the SMB segment with the features of robust performance, solid reliability and high-definition local display. Powered by the Intel® dual-core processor and 4GB of DDR3 memory, the VS-4108 Pro+ is capable of recording videos from up to 8 IP cameras, delivering exceptional performance with up to 250 Mbps throughput to ensure stable recording of multiple megapixel IP cameras. Even without a PC, the VS-4108 Pro+ can be configured and perform monitoring tasks with the local display technology by connecting a USB mouse, USB keyboard and HDMI monitor to deliver lag-free live video monitoring in Full HD (1920x1080) resolution. QNAP local display technology provides a straightforward way to reduce the total costs in your business environment. QSCM Lite is a free app provided by QVR that allows you to easily deploy up to 16 QNAP NVRs and 256 cameras and conduct central monitoring, playback, and management. 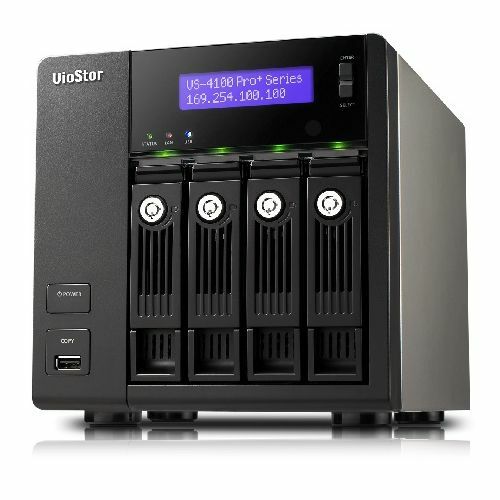 With no extra server hardware required, QSCM Lite can easily turn the VS-4108 Pro+ into a CMS server. The powerful and pioneering QSCM Lite can be freely downloaded from the integrated NVR App Center.